The new Lacie d2 Thunderbolt 3 drives continue the long standing tradition of the d2 range but bring next generation connectivity and speeds with the thunderbolt 3 / USB-C port. The d2 thunderbolt 3 features the Seagate BarraCuda Pro hard drives for industry-leading performance and reliability, perfect for bandwidth intensive creative applications. The perfect complement to SSD-based laptops and all-in-one computers, the new d2 Thunderbolt 3 massively expands your capacity up to 10TB for professional bandwidth-intensive creative applications. With Thunderbolt 3 and USB 3.1 speeds through the USB-C port, the new LaCie d2 performs perfectly on late model laptops such as the new MacBook Pro—as well as on USB 3.0-compatible computers. 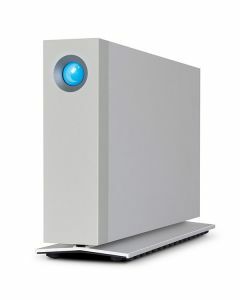 It’s also the first LaCie product to feature the Seagate BarraCuda Pro HDD for industry-leading performance and reliability, backed by a 5-year limited warranty. From a single, mighty port, you get astonishing bandwidth with the versatility of the USB-C industry standard. For the LaCie d2 Thunderbolt 3, the result is performance up to 240MB/s for cutting-edge creative workflows, the widest compatibility, and time-saving device configurations. It's even possible to power a compatible laptop through a USB-C (Thunderbolt 3 or USB 3.1) port. That’s one less cable cluttering up your desktop. The new d2 Thunderbolt 3 (6TB, 8TB, and 10TB) features Seagate Barracuda Pro enterprise-class drives for incredible reliability and performance. With industry-best capacities up to 10TB, 7200-RPM performance, and support for 24/7 operations, the BarraCuda Pro is ultra-high performance and the highest capacity desktop drive available. And for complete peace of mind, it’s also backed by a best-in-class 5-year limited warranty.